The new Moonface album, like those before it, once more reveals Spencer Krug’s well-earned place at the top of the indie rock heap. He is best known as one half the core songwriting duo of Wolf Parade, once relegated largely to synths but since given an expanded role to match Dan Boeckner, his partner in that group. If he had to be known for anything else, it would be his work in Sunset Rubdown, a sequel band of sorts to Wolf Parade, following the art-rock tendencies that began to trickle to the surface of the previous group around the At Mount Zoomer era, dabbling often with prog delivered in an indie rock idiom. And while it would be tempting to approach this record in specific or this project in general through that idiomatic lens, it would be inaccurate. Moonface in general extends his art-rock, art-pop and prog tendencies rather than those of indie rock, especially of his era. The record is a curiously structured one; a double-album that is not a double-album but two albums, and not two albums separated into separate discs but intermingled with one another, songs from one jutting against songs from the other back and forth. Each form loosely narrative song-cycles, the first being personal stories of angst, anxiety, loneliness and terror in maturity (Krug having just entered his 40s) while the second is about the ruminations of the Minotaur within his labyrinth contemplating the figures that birthed, entrapped and one day will kill him. The intermingling does the songs great favor, one cycle revealing aspects of the other, making the mythological more emotionally legible and revealing as well the mythic pitch of ordinary human emotion and experience. It often feels more like a literary novel than the standard record, using enjoined novellas describing the same thematic and emotional space from differing aesthetic palettes to open one up into the other, expanding and conjoining emotional space that we might otherwise have blocked off internally. The structural component of this record would fall flat if the music weren’t up to snuff, of course. In the digital age, where space constraints are less a physical issue and more one of attention and proper bracketing, we haven’t seen as many records experiment with an 80-plus-minute scale as one might imagine, and not all have been successful, but Krug handles the 90-ish minutes as well fellow 2018 double-album record dropper Julia Holter, doing so in the age-old method of delivering well-composed and well-performed pieces of music. The sonic aesthetic for the songs juxtapose as well as their lyrical aesthetic, with the personal songs being delivered in a tender and sophisticated jazz mode, cool alto and soprano sax singing against the hiss and rattle of drums and well-treated piano, while the Minotaur song cycle trades in these sounds for marimba and electronics and Bruce Haack-like treated vocals, often feeling like Philip Glass entering into a pop mode. The album feels like it draws inspiration mostly from Krug’s short-lived instrumental contemporary classical trio Fifths of Seven and Berlin-era Bowie, especially the more stoic and continental jazz and electronics of those records. 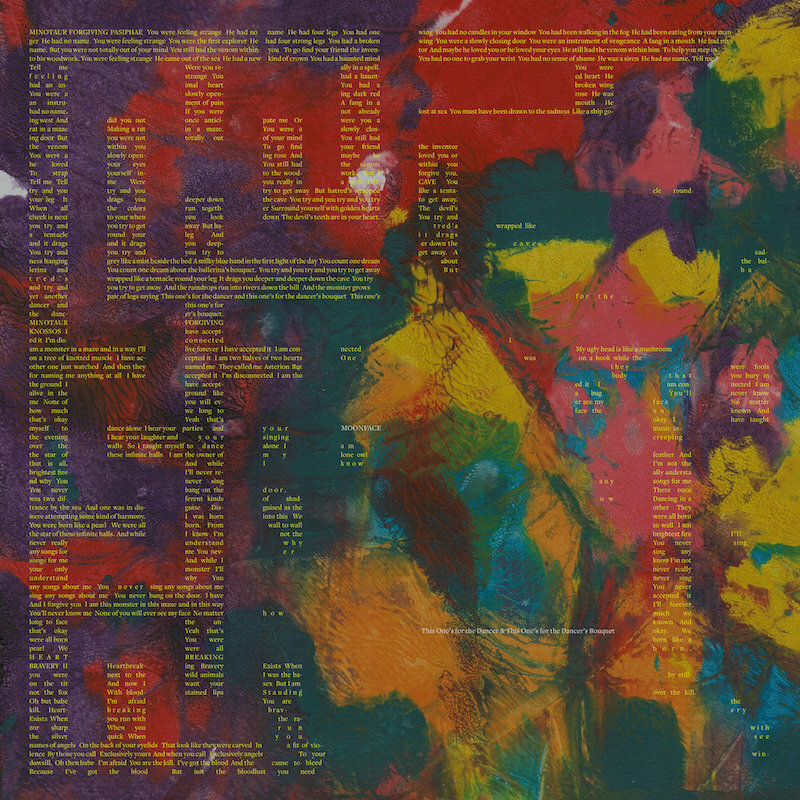 The music is progressive in a restrained and mature way, only one song creaking past 8 minutes, instead offering knotty song-structures replete with internal micro-repetition but little in the way of verses and choruses, passing in movements and sequences both large and small rather than traditional passage. 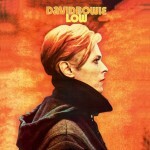 It’s remarkable to think of these songs as being composed and recorded in different sessions in different years, never destined to be joined until an editing move prompted by, of all things, simply wanting to clear the vaults of Moonface before shuttering the name to release solo music under his own name. Similar to a figure like Bowie, one of the great strengths of Spencer Krug is his lyrical and vocal ability. He retains his long-developed literary touch to his lyrics, songs trickling out in the delicate theatrical pseudo-psychedelia of academic poetry, blending both the epic cant of Grecian and Italian classics with the bleeding and bare heart of both contemporary pop poetry and the avant-garde. He delivers his remarkably well-drafted words with a weak voice, but one whose weakness reads as human fragility and tenderness rather than poor singing. 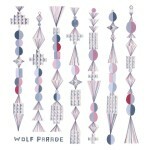 This is a great contrast to the early days of Wolf Parade, where certain tropey indie rock vocal affectations (combined with at times questionable choices for synth patches) sapped strength from otherwise well-developed compositions. Maturity and consistent work ethic has done Krug well; he knows his voice well enough that he can bend what would once have been weaknesses into strengths by altering the focus and context of his compositions. Also devoid is the jocular sense that sometimes would weaken those initial Wolf Parade and Sunset Rubdown records. Indie rock, especially of that era, seemed fixated at times on whimsy to a degree that would distract and derail otherwise strong material but here Krug is focused, soberly and somberly delivering an earnest set of songs that, given their mythic bent (both historical and self-mythology), would have felt corny if they didn’t have a sense of serious, gentle, self-assured weight to them. Krug continues a path of aesthetic maturity on This One’s For The Dancer & This One’s For The Dancer’s Bouquet, one that reveals him as perhaps the strongest songwriter of his era, exiting the second decade of his musical career releasing material just as if not more brilliant than his most acclaimed work. It marks the end of his work in Moonface, which is thus far his most musically matured and developed, an often-overlooked body compared to that of Wolf Parade and Sunset Rubdown but one of more sophisticated treasures, of which this record gainfully joins its peers. And as a close to that wing of Krug’s material, it is a superb finale, capturing well the literary fiction and contemporary classical and contemporary jazz thoughts and modes that have underpinned his work and composition since the very beginning of his career.